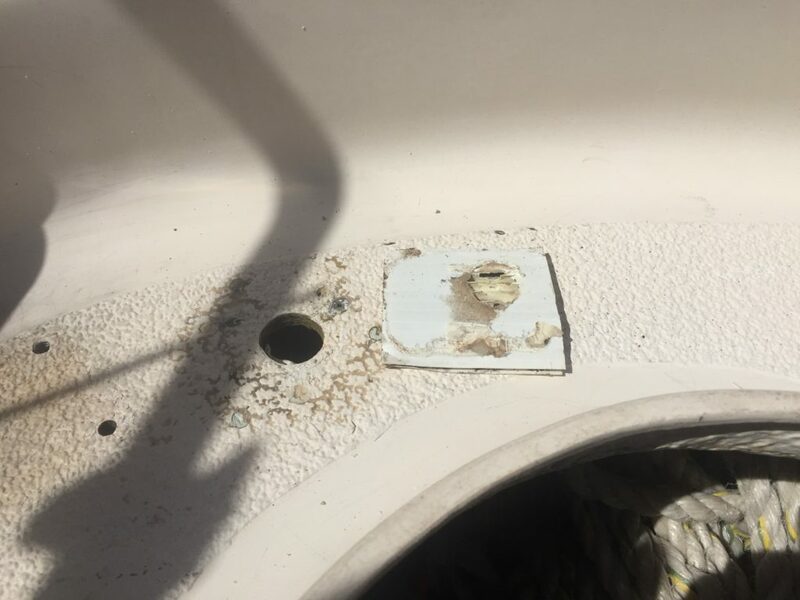 It’s 2019 already and the year has started off with boat jobs (of course), but more importantly, things got fixed. My workplace shuts down for two weeks each year over the Christmas/New Year period and I the opportunity to stay on La Mouette for just over a week to do boat jobs and to just enjoy being afloat for a few days. Unfortunately, I didn’t get a chance to take the boat out but as there was a huge amount of traffic out there on the waterways, this probably wasn’t a bad thing. Once we had put Christmas and its usual mayhem behind us, the remaining time left of the holiday break could be devoted to the boat. That was the plan, however, the car decided that it wanted a new battery, and the cats decided that they needed to go to the vets, both of them! Once you get involved in the boating world, you realise that as soon as the word “boat” is mentioned, prices just get crazy. You always have your hand in your pocket. I have come to realise that there are other industries out there just as keen to get their hands on your hard won cash, sometimes even more so than the boating world. The wedding trade for example, it’s a real money spinner but the industry that really takes the cake for ripping off customers is the vet industry. Even the boating world can learn something from the vets. Of course we all love our animals and want the best for them, and the vets really take advantage of this, to the point of almost being unethical. Needless to say, the cats really bunged it on with the resultant vet’s bill costing an arm and a leg. So it wasn’t all plain sailing over the break. Debbie still had to work and we also had a third cat to look after, as Debbie’s parents went on holidays and we looked after their cat also. Cats, cars and Christmas, what a way to spoil a holiday! D’Albora marina opened up a new restaurant and bar at the end of December and we gave the new services a thorough workout. They also had take-out alcohol which we also took advantage of. After a hot day’s work on the boat, it was good to just kick back and have a beer, either out of the fridge on the boat, or straight out of the tap at the bar. It’s a good way to wind up the day’s work. Not to mention a good way to start the day also, with a coffee and breakfast at the restaurant. A lot of boats have leaks of one sort or another and La Mouette is no exception. 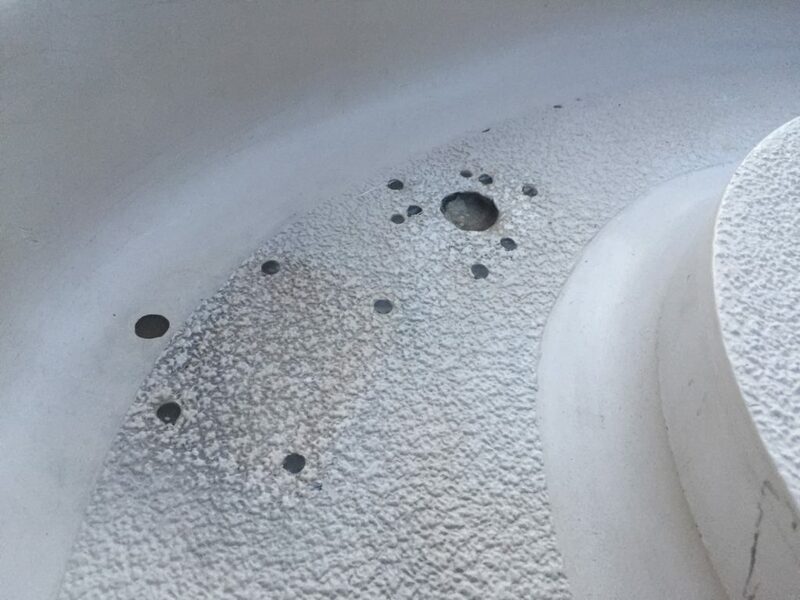 Generally, the bilge is dry but after rain, or hosing down the boat, water gets in from somewhere and collects down in the bilge. 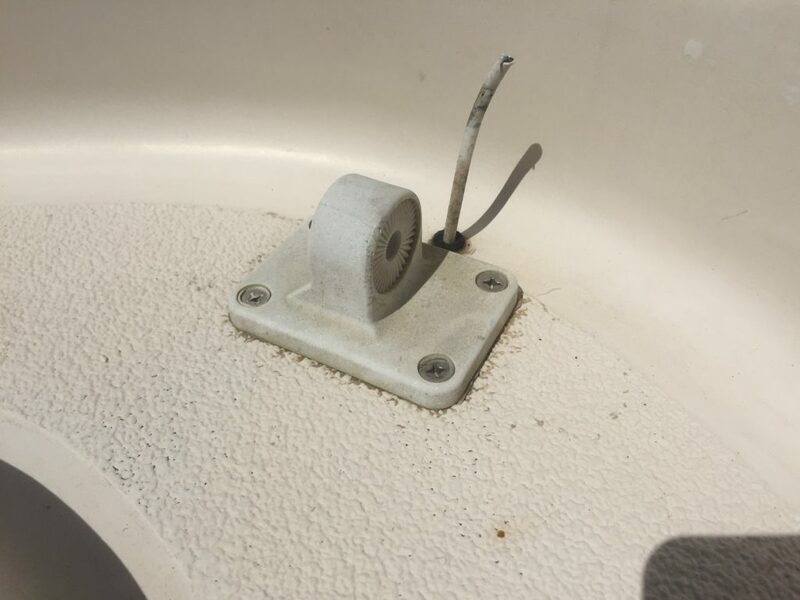 I eventually tracked the leak down to a one inch hole in the rear of the cockpit that someone had drilled a long time ago for some long forgotten accessory but it had never been properly fixed. A very makeshift repair indeed! As a makeshift repair, a piece of corrugated plastic packing had been stuck to the underside of the hole with Sikaflex. It probably worked OK for a while but with a bit of wear in the top side of the packing, and the water would just go straight through. I found this by testing it with a glass of water. I poured the water over the hole and it just disappeared! Obviously that was the source of the water ingress. In the same area, were two aerial bases. Once was the VHF and the other for the 27 mhz. Both the radios have been scrapped, making the aerials redundant and all that was left was the two bases. These needed removing and holes plugged along with the holes for the aerial cables. Also, in the area were lots of plugged up screw holes. The plugs on some of these looked quite dodgy and were obviously not permanent repairs. These were remove and I was left with one large hole of approximately one inch, 8 aerial screw holes, 2 aerial cable holes of approximately 10 mm and about half a dozen other screw holes. This is was to be my work for the week, staying on the boat overnight, getting up in the morning and working away on the fibreglassing etc of the holes and then relaxing at night and repeating. A professional shipwright or fibreglass expert would be able to knock this job over in a couple of days, but it’s natural that a muggings like myself would take a week. Added to this was the heat. A couple of days it got to 40 degrees Celsius and made working on the boat quite unpleasant at times. I did have a boom cover rigged up which gave shade and there was usually a bit of wind which made it bearable. Down below it was usually about 30 degrees and of course over at the bar it was lovely and cool. Fortunately, at night and especially around 9 pm, the temperature would drop and it got quite cool. I don’t know what it would have been like had the temperature stayed in the 30’s. The fibreglassing went smoothly and it didn’t take too long to get the holes filled. The big hole required laying down chopped strand matting and it all went well, although it took several days to get the hole filled with about 4 layers of CSM each time. One of the things I learned that week was that you could put another layer of resin and CSM on as soon as the resin has hardened, not wait six hours or so, or even until the next day. The major problem was the non-skid gelcoat surface. Matching up the non-skid pattern was always going to be difficult. By the end of the week, the holes were done and I had gelcoat layed down, but it certainly wasn’t an invisible repair. To my eyes it was a rough job. No more leaks but it didn’t look as good as I hoped. I have since found a method of making a mould of the non-skid and using that to patch up the surface. Thanks to Andy from the YouTube Channel, Boatworks Today. Stage two of the repair will be to try and restore the non-skid gelcoat and there are a lot of things to work out. Is the non-skid pattern random, ie I can make a mould of another section of non-skid and have it match perfectly? Will it work for a relatively small area with a lot of furniture in the way? A lot of unanswered questions, but more about that next time.